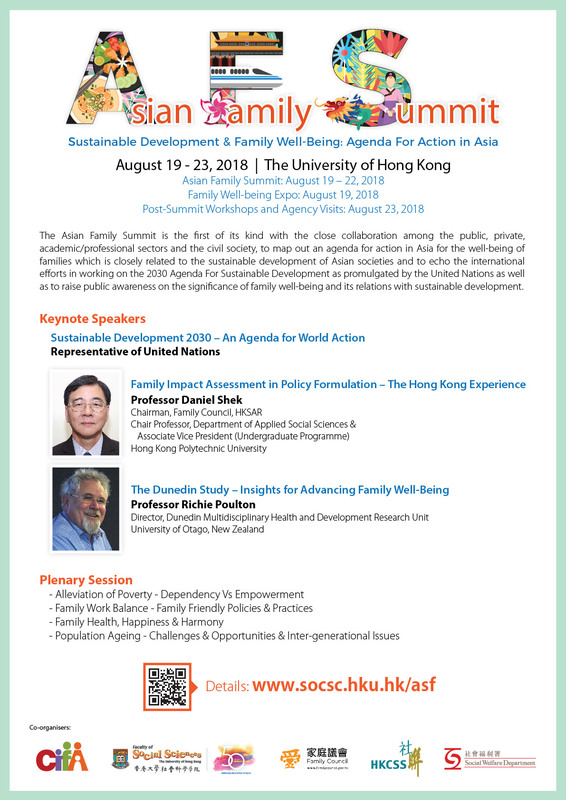 You are cordially invited to attend the Asian Family Summit to be held at the Grand Hall, Lee Shau Kee Lecture Centre, Centennial Campus of The University of Hong Kong from 19 August to 22 August 2018, with a Family Well-being Expo on the first day. This Summit is a joint effort of key stakeholders in Hong Kong, including the Consortium of Institutes on Family in the Asian Region (CIFA), the Faculty of Social Sciences (FOSS) of The University of Hong Kong (HKU), the Family Council (FC) of the Hong Kong Special Administrative Region (HKSAR), the Hong Kong Council of Social Service (HKCSS) and the Social Welfare Department of HKSAR. The Summit aims to provide a platform for public, private, academic/professional and the NGO sectors to map out an Agenda For Action in Asia for the well-being of families and to echo the international efforts in working on the 2030 Agenda For Sustainable Development as promulgated by the United Nations. To be in line with the 2030 Agenda, the Summit has chosen “Sustainable Development & Family Well-Being: Agenda for Action in Asia” as its main theme. We would also like to seek your assistance in spreading the news of this Summit with a view to appeal for active participation from organisations and sectors in the various parts of Asian Region. In case you need more information, please feel free to contact the AFS Secretariat at (852) 2859 5301 or info@cifa-net.org. © Copyright 2016 Consortium of Institutes on Family in the Asian Region (CIFA) All rights reserved.